This picture was taken at Yarada Beach Resort near Vizag, Andhra Pradesh, India. I visited the beach (which merges into Bay of Bengal) April of last year and it was simply fantastic! I am not a swimmer but couldn’t stop getting myself wet in the ‘still clean’ waters. Since this beach is pretty far away from the city of Vizag, there still aren’t many tourists who visit this place often…which means it’s is much more cleaner than it’s counterpart…Ramakrishna Beach. This entry was posted on June 11, 2008 by IdliDosa. 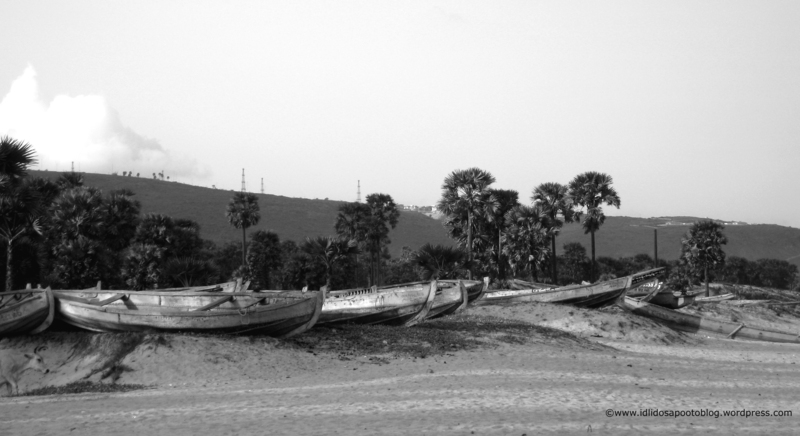 It was filed under Places and was tagged with andhra pradesh, bay of bengal, beach, Black and White Photography, boats, coastal andhra, holiday, india, photography, resort, sea, tour, tourism, vacation, vizag, yarada beacj resort.